Little engine drivers will love pushing this train around the track, stopping to load up the crates of fresh apples and pumpkins as they go. There's also a level crossing and a car to operate, so you can talk to your child about traffic safety while creating role-play stories together. LEGO® DUPLO® bricks are specially designed to be fun and safe for little hands. Includes 2 DUPLO figures. Last known price is 13% below the initial Lego retail price! 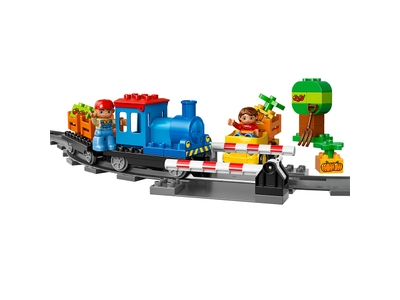 The Push Train (10810) Lego set is no longer directly available from the sites below. However, 3rd party partners of these sites might still have the set available. Alternate description Push the train around the track and open up the level crossing to let the car through, to teach your child about traffic safety. Includes 2 LEGO® DUPLO® figures. Includes 2 LEGO® DUPLO® figures: a train driver and a car driver. Features a buildable train with hinged roof, wagon, car, opening level crossing, train track and a buildable tree. Encourage role-play between the 2 LEGO® DUPLO® figures. Use the level crossing to talk to your child about road and railroad safety. Accessory elements include crates for loading the train or car, flowers, and bricks decorated as apples and pumpkins. LEGO® DUPLO® products are specially designed to besafe and suitable for small hands. Train with wagon measures over 3” (10cm) high, 11” (28cm) long and 2” (6cm) wide. Car with LEGO® DUPLO® figure measures over 3” (9cm) high, 4” (11cm) long and 2” (7cm) wide. For use with LEGO® DUPLO® trains only. Combine with the 10506 Train Accessory Set, 10507 My First Train Set or 10508 Deluxe Train Set for even more LEGO® DUPLO® train fun!